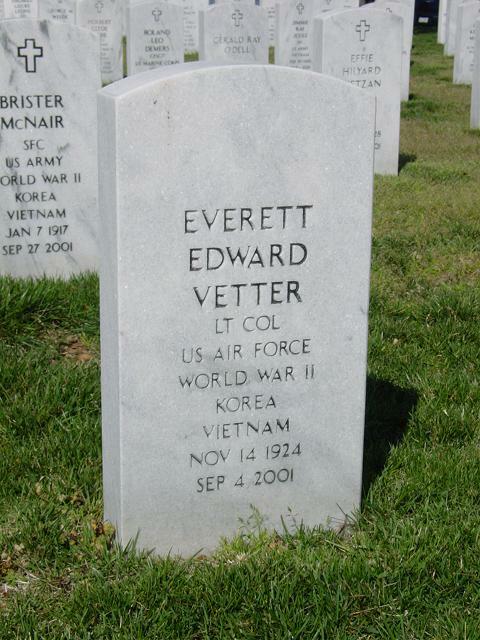 Retired United Staes Air Force Lieutenant Colonel Everett E. Vetter, age 76, died on September 4, 2001. Born in Galloway, Wisconsin, November 14, 1924, oldest child of Bruno R. Vetter and Grace (Cannady) Vetter. He attended public schools in Rosholt, Galloway and Mosinee, Wisconsin, and graduated from the University of Maryland with a B.A. and The George Washington University with a M.A. He enlisted in the U.S. Army in 1942, was commissioned as an aviator in 1944, and retired as a Lieutenant Colonel, United States Air Force in 1965 after having served during World War II, Korean War, stationed in England, Germany, Japan and the Phillipine Islands. He was a member of the National Military Intelligence Association. He entered civil service in 1965 and retired in grade GM-14 in 1985. He worked for the Internal Revenue Service, HQ USAF Pentagon and the Defense Investigative Service. He is survived by his wife, Irene; two sons, Douglas of Springfield and David of Seattle, WA. Graveside Military Honors will be on October 9, 2001, 3 p.m. at Arlington National Cemetery, Arlington. Please meet at the administration Building at 2:30 p.m.